The adult guava fruit fly (GFF) is about the size of a housefly, 5 millimeters (mm) in length. 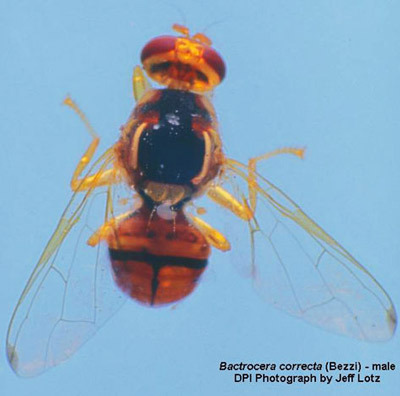 The top of the thorax is black with yellow patches, the abdomen is yellow-orange with a dark T-shaped mark, and the face has two black spots which “bleed” toward each other, sometimes connecting to each other in the middle. The wings are clear with a very light dark streak along the front edge to about 3/4 length, followed by a separate light dark spot at the tip. Immature stages of GFF have not been described in the literature, but are likely typical for members of this genus; i.e., the egg is very small, white, cylindrical, rounded at the ends and about six times as long as wide; the maggot (larva) is creamy-white, legless, and may attain a length of 6 to 10 mm; and the pupa is encased in a dark brown cylindrical puparium. The GFF is an exotic insect originating in southern Asia from Pakistan eastward through India and into Thailand. GFF feeds on many kinds of fruit and vegetables. Important California crops at risk include guava, peach, cherry, citrus, and melons. Damage occurs when the female lays eggs in the fruit. These eggs hatch into larvae, or maggots, which tunnel through the flesh of the fruit, making it unfit for consumption. The first California detection occurred in Orange County in 1986, and since that time, several re-introductions have been delimited and successfully eradicated. GFF is widespread through much of the mainland of southern Asia, from Pakistan eastward to Thailand and southern China. Females lay eggs under the skin of host fruits. The amount of time it takes for egg development depends on the ambient temperature, but is normally about two days. Maggots tunnel through the fruit feeding on the pulp, shed their skins twice, and emerge through exit holes in eight to 17 days, depending on temperature. The larvae drop from the fruit and burrow into the soil to pupate. The pupal period varies from seven to 18 days. The newly emerged adult females need 16 to 38 days to mature sexually prior to egg-laying. Breeding is continuous, with several annual generations. A number of commercially valuable fruits and vegetables are attacked by GFF (see Partial Host List). Fruit that has been attacked may be unfit for consumption due to the larvae tunneling through the flesh as they feed. Decay-producing organisms then enter, leaving the interior of the fruit a rotten mass.